According to the calendar, it’s fall. According to the thermometer, it’s still summer! Upper 80’s and drippy-humid. That’s just wrong for mid-October. Even if the weather won’t cooperate, we can still enjoy some luscious fall treats, right? Just like you, when the calendar turns to fall, the first thing I think of is pumpkin. 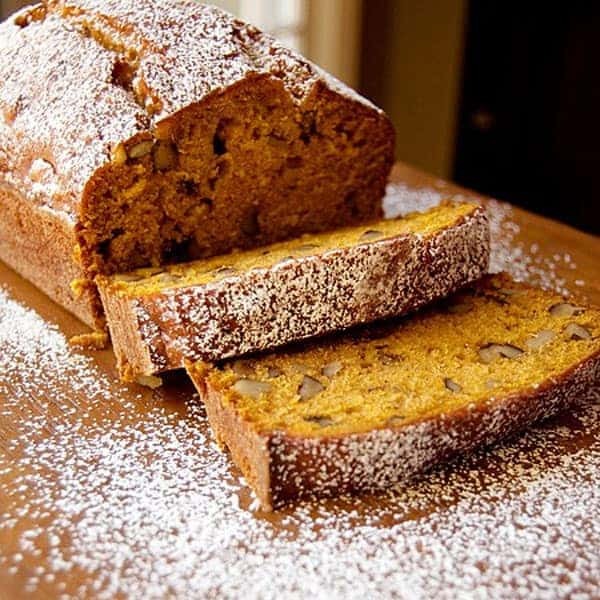 I have quite a few pumpkin recipes – a delicious Pumpkin Roll, the Glazed Pumpkin Pound Cake I shared last week, and this wonderful Black Walnut Pumpkin Bread. This bread is good any time of day – for dessert, an afternoon snack or with breakfast. I especially enjoy a slice with a cup of sweet, creamy coffee. I was already planning to make a loaf of my standard not-too-sweet pumpkin quick bread and when I saw the bags of black walnuts at the grocery store I just knew that they would make a great addition! Have you ever cooked with black walnuts? The fragrance! It’s just amazing. It’s a beautiful, almost perfume-like scent. The brand I normally use are Hammon’s and according to the Hammon’s company web site, they are wild, hand-harvested black walnuts which they buy each year from individuals across the Midwest. Even though they cost a little more than regular walnuts, they are so worth the price. If you see them in your store this fall, be sure to take some home and try this fabulous quick bread. Preheat the oven to 350 degrees. Grease and flour a loaf pan and set aside. 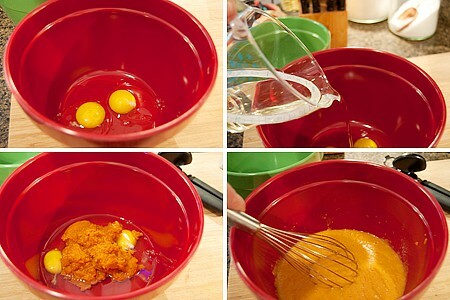 Combine the eggs, oil, pumpkin and water in a large bowl. 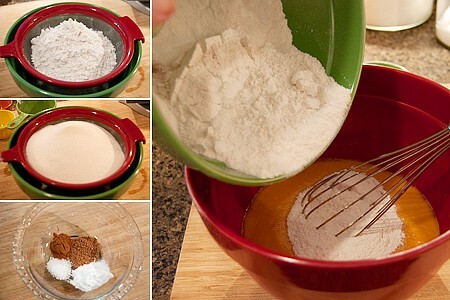 Sift the dry ingredients together and stir into pumpkin mixture. Bake for one hour or until a tester inserted near the center comes out clean. Dust with powdered sugar before serving, if desired. A not-too-sweet pumpkin quick bread with the addition of wild American black walnuts. Grease and flour a loaf pan and set aside. together and stir into pumpkin mixture. Stir in walnuts. 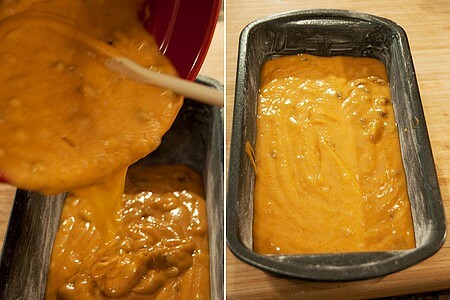 Pour into the prepared loaf pan and bake for one hour or until a tester inserted near the center comes out clean. What a moist, delicious looking bread. Great picture – love the sprinkle of powdered sugar. Thanks so much for linking to my post! You’re welcome! Your recipe looks like one I’ll have to try soon as well. Not everyone has the same reaction to black walnuts but I admit to a similar addiction. This year’s nuts won’t be available for a couple of weeks still, worth waiting for though hard to say what hits the grocery stores when. You can also buy a black walnut extract that is very good. In the mean time, you might like this little story about a black walnut tree. Oh, you are so right about the appeal of black walnuts. They have that intense, more-walnuty-than-walnuts flavor and such a wonderful aroma. I’m so happy you did pumpkin dishes twice in a row. I just love what you’ve done with this bread! This looks wonderful!! I just made a recipe of pumpkin bread, but it doesn’t look as good as yours. Black walnuts bring back memories of Aunt Bernice and her black walnut cake that she made at Christmas every year. Shelling the walnuts will make a saint take to drink, so you can understand why she only made the cake for very special occasions. I don’t remember that cake! I wish I had the recipe now that I know where to buy the black walnuts. Do you happen to have it? You could never bore me with pumpkin. And I’m always looking for another great pumpkin bread recipe! This looks completely fabulous. Now I want pumpkin bread too! I love pumpkin time. I’ve never come across black walnuts before–where would you get them? In any case, this looks yummy! Wouldn’t those black walnuts be good in the banana nut bread, ice cream or with bananas in the ice cream. Can’t remember what brand it was, but used to eat the ice cream when I was growing up. Black walnut has always been my favorite ice cream. Adding bananas sounds really, really good, too! This is so fabulous. I’m definitely making this next weekend! Oh I love it Lana! I bet the flavor was amazing! 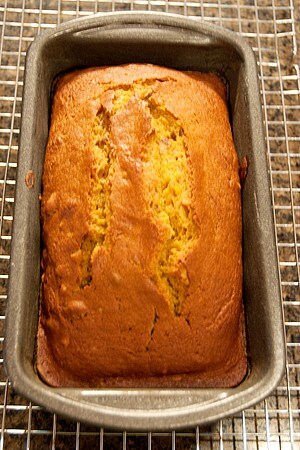 This pumpkin quick bread looks heavenly! I am going to have to bake it too. This looks so moist and delicious! Perfect for wrapping in parchment and giving to friends as a nice fall gift :) Or just eating yourself!!! Lana ~ I LOVE black walnuts and I know not everyone does; will almost always order a black walnut ice cream if that’s a choice on the menu. This looks terrific! I honestly didn’t realize they were such an acquired taste! I’ve always loved them and black walnut ice cream is my first choice, too. They really added a lot to the pumpkin bread recipe. Nothing says ‘Fall’ like Pumpkin Bread. I am a college student and I baked this for a couple friends. It was like a little piece of home we could all enjoy! Thanks, Lana! Awww….that makes me smile from ear to ear! This recipe is delicious! I’ve got a gallon of black walnuts from my grandparents’ backyard and I’ve been looking for a recipe to use them. Your recipe combined my love of pumpkin and walnuts. I’ll have to share the recipe with my grandmother, too. Hi Lana – I’m the Director of Marketing for Hammons Black Walnuts. I came across your recipe on Pinterest. Thank you so much for sharing it! We’ve pinned it to one of our boards. Your readers can visit our site at http://www.black-walnuts.com to find a list of stores with black walnuts in their area. We also sell them online too. Thanks again – we appreciate you! Hello Susan! You’re very welcome. I always like to bring great American products to my readers’ attention. 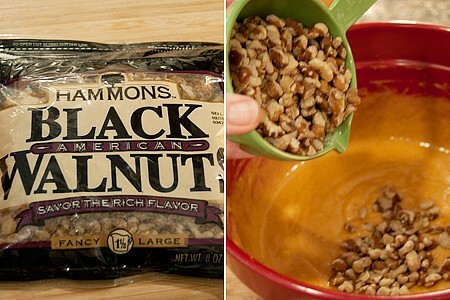 Hammons black walnuts are always high quality and reasonably priced. And the taste is incomparable. My thanks to you for making your product available in our grocery stores! Unfortunately, I’ve never seen black walnuts in my neck of the woods. I guess regular walnuts or pecans would work well. Would love to try the black ones though. I’ll have to keep an eye open for them here in Atlantic Canada. Ok, I just looked up the places to buy black walnuts and I see that they’re sold at Costco. Will have to have a look for then next time I’m there. I made this and the aroma alone was amazing. Very tasty, thanks for sharing!